In what seems to be an unintentional release of information, the floor count for two of Chicago’s most anticipated towers was recently listed online. On an Epstein webpage, which has since been removed, the number of floors for Wolf Point East and Wolf Point South was listed as 64 stories and 70 stories, respectively. The page also described Wolf Point South as a mix of office and residential, information that seems to put to rest the rumor that the tower might include a hotel. Both towers were designed by Pelli Clarke Pelli Architects, and their heights, one of which may reach over 900 feet, have been the topic of much discussion. 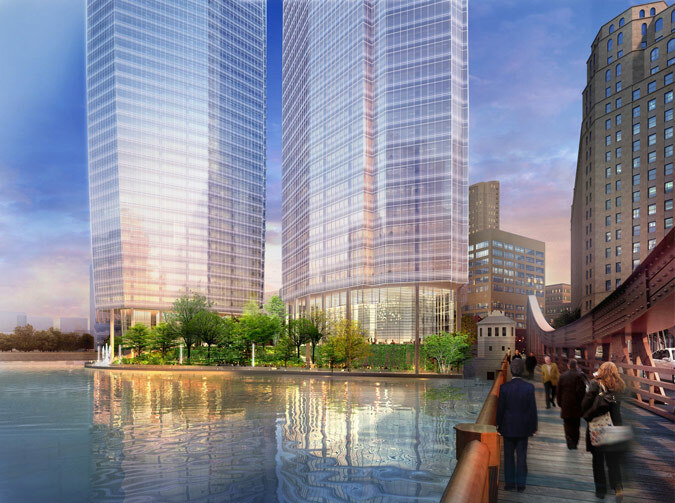 Wolf Point East is expected to break ground in 2017. As Chicago gears up for an overhaul of the city’s Riverwalk, Mayor Rahm Emanuel has touted his architectural cause célèbre as a way for the city to reengage with its “second shoreline.” The renderings by Sasaki Associates show six new blocks of riverfront parks, effectively connecting the shore of Lake Michigan with a small park at the foot of the three massive towers planned for Wolf Point, at the confluence of the Chicago River’s three branches. Chicago Magazine scribe Whet Moser has a good suggestion for "Emanuel's latest obsession": learn from other riverwalks. The three he points to are in Indianapolis, San Antonio and London. Indianapolis has come back considerably from the depths of its urban flight. Its riverwalk should be a big beneficiary of that resurgence, but Moser quotes an Urbanophile blogger who notes Indy’s riverwalk remains relatively separate from its downtown business district. San Antonio and London took steps to integrate their riverwalks into the surrounding communities by adding mixed-use and expanding into neighborhoods beyond downtown. The plans as presented currently are ambitious in engaging the river downtown, but they focus on recreation rather than retail. While a riverside shopping mall is not ideal, a little more room for mixed-use development probably would enhance the experience. Likewise, the six blocks planned lay a framework for expanding into neighborhoods along the river to the north and south of the Loop, but are currently limited to downtown. Ping Tom Park in Chinatown is not far away, and one can even imagine (with a little optimism) that the industrial legacy of Goose Island just to the north could be reborn with a bit of greenspace. And other cities around the Midwest are renewing their riverfronts, as well. Des Moines' new riverwalk is nearing completion, and Detroit’s recently got a boost in funding to build on a design competition spotlight. Ross Barney Architects and Sasaki Associates are the designers on the project. After a few administrative hurdles and several packed community meetings that aired downtown residents’ concerns, Chicago's Wolf Point is poised to turn perhaps the most prominently underdeveloped piece of land in Chicago into a billion-dollar suite of skyscrapers along the Chicago River. Now that they have cleared the plan commission, developers Hines Interests and Magellan Development are ready to go as soon as they get the final permits in place. Construction will start with the bKL-designed, residential west tower (493 feet tall), which is expected to take 20 months. Towers two and three designed by Pelli Clarke Pelli (950 and 750 feet tall, respectively) will go up after that. The designs of those towers—which will contain office, retail, hotel, and parking space—are not set in stone and could change as the plan rolls out over the next few years. The points of contention raised by audience members at many meetings held since the project was unveiled included some typical complaints about blocking views, as well as opposing calls for more and less parking. Located near some CTA stops, the Pelli Clarke Pelli-designed complex dialed down its parking footprint somewhat—not enough for some transit enthusiasts, and too much for others who worried what the massive development’s impact could be on this dense corner of the Chicago River. The biggest stir caused by the Kennedy's newest proposal for developing Wolf Point was not obscuring the Merchandise Mart views or initial reactions to the renderings or the stuffing of three very tall towers on one impossibly small piece of land. It was more like, “There’s a living Kennedy with a stake in Chicago real estate?” We all know the family sold the Mart years ago. Fewer of us knew they held on to that little sandbar that sits in front of the the Sun-Times building. Ready to boost the family fortune, the Kennedys with Hines, Cesar Pelli, and bKL plan to stuff three towers onto the site. Is this the architectural equivalent of a 10 lb. bag of sugar in a 5 lb. sack? Maybe, but development of that scale is also kind of exciting. And that leads to the biggest question. Can this economy support a residential and commercial project of this size? Well, Jean—that’s the last sibling standing, right, so the land must be hers—get out your good-faith checkbook: Google is coming. They’ve leased the top floors of the Mart, which will serve as the new headquarters of Motorola, which Google has acquired. That means thousands of high paying fancy Google jobs just across the street. With that news, Wolf Point is a done deal, no? According to the Sun-Times, the Kennedy family and top tier developer Hines are working on plans for three towers at the Wolf Point site, just west of the Merchandise Mart, to be designed by Cesar Pelli. 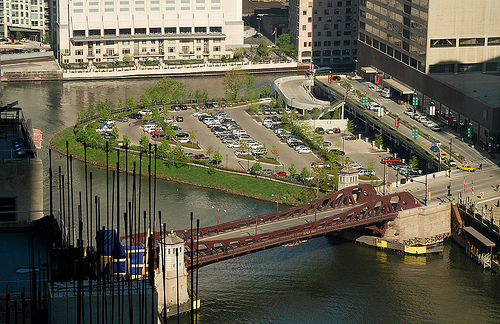 Currently used as a parking lot, the Kennedy-owned site has dramatic views of the covergence of the Chicago River as well as the Loop. Plans call for the tallest building to reach 60 stories. No word yet on the uses for the buildings. Full details of the proposal are expected to be released in March or April. Pelli's only other building in Chicago is an office tower at 181 West Madison.